I finally made it to the store this weekend. The last few weeks we have been so busy we would just run in for banana’s, almond milk, and what ever else we needed for survival. This week my kitchen is stocked with anything a girl could ask for. Last night I made a Mexican Quinoa Dish that was so amazing my husband and I ate a huge serving bowl full. Since it was full of healthy, yummy goodness neither of us had that overeating bloaty feeling. YAY for eating plants! While grocery shopping I had one of those experiences that only really happen a few times a year. I’m pushing my cart through the store and smell a glorious medley of apricots, nectarines, and peaches. I stopped my cart and backed it up, then filled bags with yummy summer time fruit. If you shop at Sprout’s I was the crazy lady smelling the pineapples too! This happens to me in the fall when apples catch my attention too. Breakfast this week will be bagels (I found them on clearance), oatmeal, Breakfast Quinoa, my husband likes Baked Sweet Potatoes with a little cinnamon, toast, and fruit. Lunches will be leftovers (more quinoa), nut butter sandwiches, GF pasta with veggies, leftover pancakes (from Father’s Day), and anything else inspiration stirs up. I’m experimenting with this style to see if I can save time and cut down on a little waste. My husband usually takes leftovers for lunch so this may help us be better prepared to that too. What are you eating this week? Are there any grilled veggies in your future? Are you in love with summer fruit like I am? It is like “candy land” now with produce – my eyes are bigger than my refrigerator :-), but ya gotta enjoy it all while it’s out there! Agreed! I love that my son’s beg for fruit instead of junk! I must say that meal planning stresses me out – I find it a necessary evil. I will be interested to see how your “build your own” meals go. I am still new to this way of eating, so I feel like I need to plan everything out to the last detail. Anyway, are you going to post the recipe for the Mexican Quinoa dinner? I am always on the look out for extra non-rice dishes. How do you kids do with quinoa? It will be new to mine (4 and 2). Thanks for the great blog. Hi Michelle, I normally plan everything out but I just want to try something different. I don’t like to spend as much time in the kitchen now that it is summer so I’m hoping this method will help me. My boys 1 and 3 like quinoa. It isn’t as sticky as rice so you may want a sauce to keep it together. I add cinnamon and fruit for Breakfast Quinoa and spices for a dinner quinoa. My boys love taco seasonings. Sometimes I’ll mix it with “un-fried beans” so it is easier for them to eat. 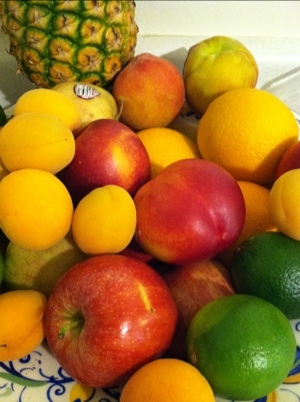 This time of year is so amazing produce-wise…makes me want fruit at EVERY meal! Your meal plan sounds great. Can’t wait to hear how the serve your own dinners go.